Bad Bat Productions: Pilgrim Shadow / A Recipe for Disaster - Comedy Double Bill - Tickets available now! 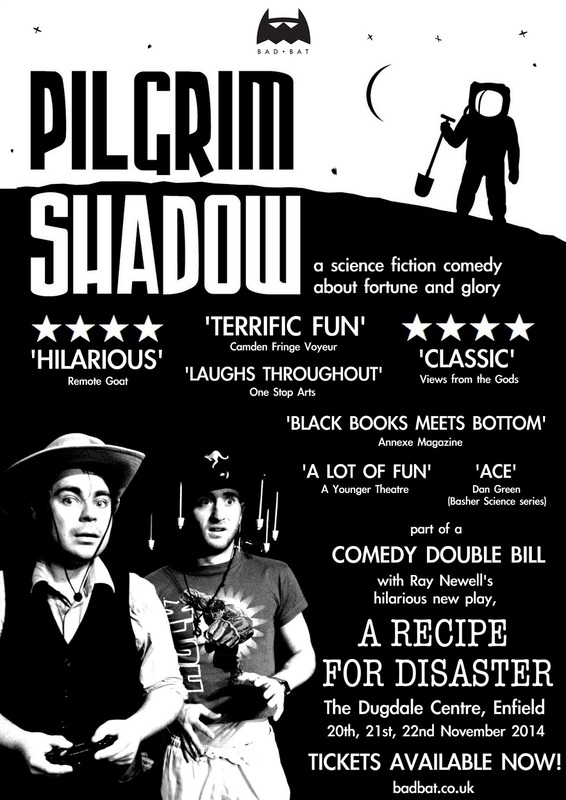 Pilgrim Shadow / A Recipe for Disaster - Comedy Double Bill - Tickets available now! The Future Boys are back! This Autumn will see the return of PILGRIM SHADOW, Steve Jordan's acclaimed science fiction comedy play from last year's Camden Fringe Festival. Join Tyler and Gary, the Future Boys, as they embark on a quest for a lost treasure haul in the far reaches of the galaxy. The show will run as part of a double bill with Ray Newell's A RECIPE FOR DISASTER, with both plays starring Cliff Chapman and Adam Joselyn. So, even if you've seen Pilgrim Shadow before, there's a whole new play as part of the bargain! The show will run for three nights, 20th, 21st and 22nd November 2014, at the Dugdale Centre in Enfield, North London as part of a joint production between Bad Bat and the Enfield Theatre Co-Op. And guess what? Tickets are on sale NOW.